As ferocious as they were, even the Vikings understood that having a shield could mean the difference between life and death in a battle. Thus, many would carry this Wooden Viking Kite Shield into battle, assured that this shield would protect them. And of course, a shield of this size rarely disappointed its wielder, so long as it was used properly. Kite shields come in two distinct shapes, with one being the reverse tear-drop shape that featured by this shield. The shield is made from hardwood and features a rounded top, as well as a distinctive point at its bottom. The shields face features a central boss at the center, for both ornamentation and additional defense. The shields face also been hand painted to feature a solid-colored pattern with four spokes of color emanating from the central boss and extending out to the shields edges. The back of the shield features two leather straps, with one being longer than the other so that it might be hung over the shoulder to provide better weight distribution. 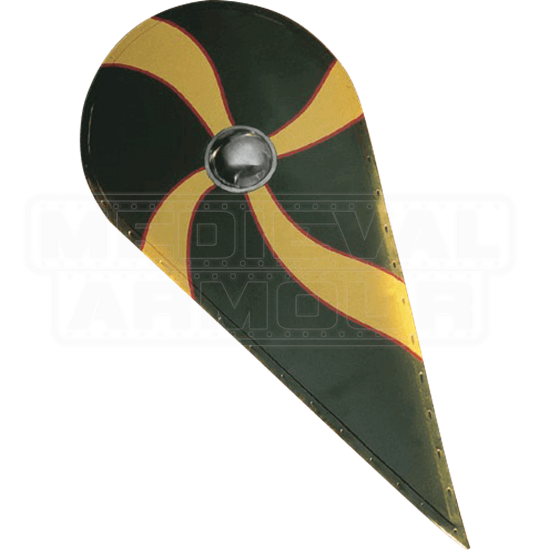 This authentic Wooden Viking Kite Shield is a fantastic defense to carry into battle, providing more than enough cover to keep a warrior relatively safe. And when you are not in battle, you can display it in your home like the historically accurate piece that it is.